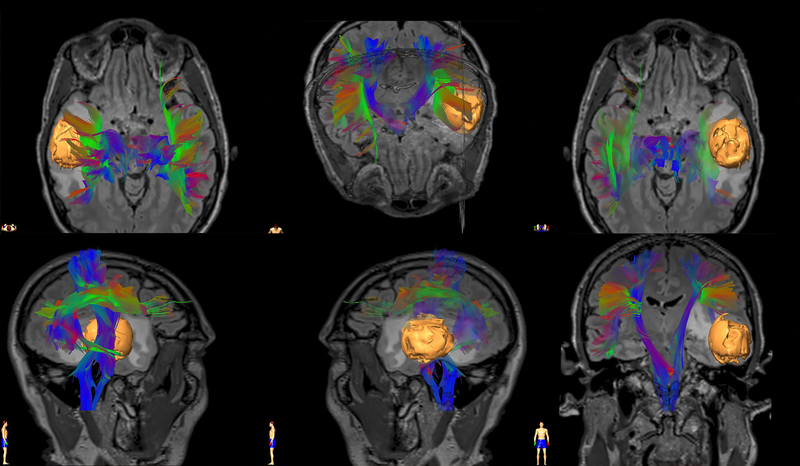 Functional MRI images shows presurgical brain mapping of the critical motor and language white matter pathways around a glioblastoma tumor (orange) for a patient enrolled in the SPORE project testing a novel neural stem cell treatment. Images courtesy of Benjamin P. Liu, MD, a co-investigator on the SPORE. This article was originally published in the Breakthroughs Newsletter. Find more stories like this, as well as the new Breakthroughs Podcast, on the Breakthroughs homepage. Feinberg and the Robert H. Lurie Comprehensive Cancer Center of Northwestern University have created a robust research enterprise to improve outcomes for patients with brain tumors. This goal is especially important for glioblastoma (GBM), one of the most common and aggressive of primary malignant brain cancers. While gains have been made in treating GBM, today’s standard of care only yields a median survival rate of 15 months. In August, Northwestern Medicine scientists obtained a highly competitive $11.5 million grant from the National Cancer Institute (NCI) that supports research to change this sobering reality. With this new award to the Lurie Cancer Center, Northwestern investigators are now leading a Specialized Program of Research Excellence (SPORE) in brain cancer with a special emphasis on GBM. The NCI’s SPORE program advances cancer research focused on specific organ sites, from breast to lung and brain to prostate. It awards institutions around the country that demonstrate they have the talent and resources to bring scientific breakthroughs to the clinical setting. Designed to promote discoveries that rapidly translate to human application of novel cancer therapies, these prestigious grants support projects — typically four — currently in or poised to enter clinical trials. The NCI stipulates that these studies must touch and significantly benefit the lives of oncology patients within the five-year period of the grant. Earlier this year when Lurie Cancer Center investigators applied for the brain tumor SPORE, two of their proposed GBM studies were already in clinical trials. 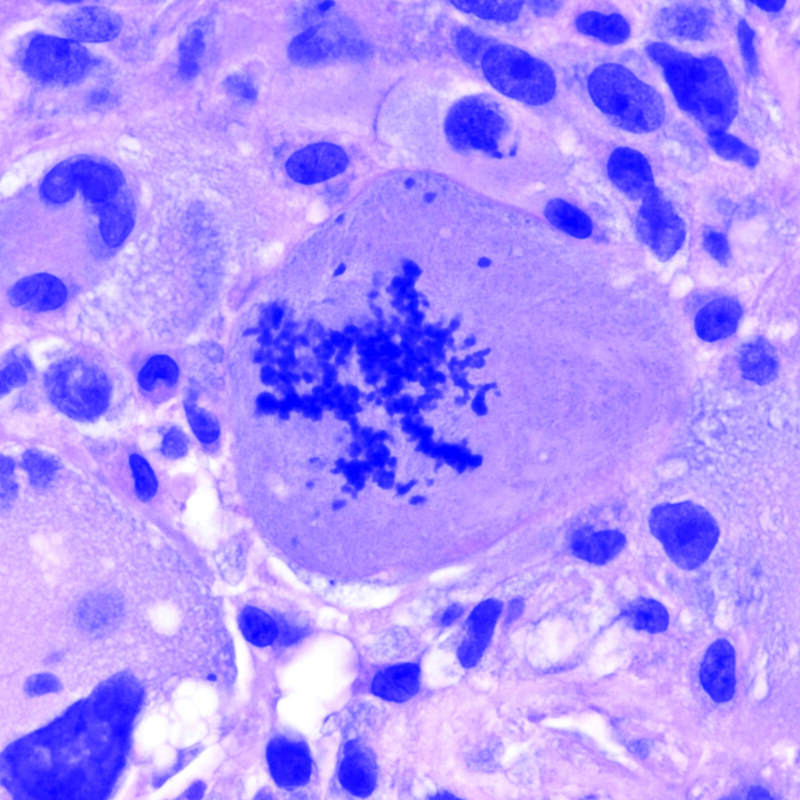 Atypical mitosis in a glioblastoma. Image courtesy of Craig Horbinski, MD, PhD, who leads the biospecimen core for the SPORE. One of the Northwestern SPORE projects features the first drug to use spherical nucleic acids to deliver and target gene suppression in tumor cells. Developed by Chad Mirkin, PhD, director of the Northwestern’s International Institute for Nanotechnology, and Alexander Stegh, PhD, associate professor of Neurology in the Division of Neuro-Oncology, the novel drug has been shown to cross the blood brain barrier to reach intracranial tumors in animal models. In the phase 0 clinical trial that is ongoing, the drug targets the gene BCL2L12 to promote therapy-induced apoptosis in glioblastoma. The study seeks to determine if systematically administered nanoparticles reach tumors cells in patients with brain cancer. A second SPORE project involves a first-of-its kind clinical trial employing neural stem cells, which produce a virus that infects and kills tumor cells. Developed by Lesniak, the cells are injected throughout the resection cavity that remains following surgical removal of the tumor bulk. This phase I study aims to show that the novel stem cell therapy can be safely administered to patients with newly diagnosed GBM and ultimately improve outcomes. To date, eight individuals have participated in the clinical study with promising results, according to Lesniak. The third project, co-led by Derek Wainwright, PhD, assistant professor of Neurological Surgery, and Microbiology-Immunology, and Rimas Lukas, MD, associate professor of Neurology, involves two immunotherapies for treating glioblastoma. The Wainwright laboratory has studied the influence of an enzyme known as ID01, whose activity suppresses a patient’s immune response against their tumor. Devising strategies to block the enzyme with approved IDO1 pharmaceuticals, investigators will inhibit IDO1 while treating with a second therapeutic that further stimulates patient immune response against their tumor. A clinical trial for evaluating this novel therapeutic approach will initiate next year. The final project focuses on an activator of autophagy known as ATG4B. Recently discovered by Shi-Yuan Cheng, PhD, professor of Neurology, this project will investigate the effects of inhibiting this new therapeutic target while treating with either radiotherapy, the cytotoxic drug temozolomide (TMZ), or a combination of radiotherapy and TMZ. The latter, combined radiotherapy and TMZ for treating GBM, is known across the globe as the “Stupp Protocol” — named after renowned neuro-oncologist Roger Stupp, MD, who joined Northwestern Medicine in 2017. Stupp and Leonidas Platanias, MD, PhD, director of the Lurie Cancer Center, are co-investigators on this SPORE project, which will evaluate the effectiveness of NSC185058, a recently discovered inhibitor of ATG4B, for use in patients. These new projects require a range of scientific and administrative support, drawing from newly established entities within the Brain Tumor SPORE. The Biospecimen Core, co-directed by Craig Horbinski, MD, PhD, associate professor of Pathology, and Daniel Brat, MD, PhD, professor and chair of Pathology, will serve as a source of high-quality samples, collecting up to 400 new tumors and matching blood samples per year from surgical procedures at Northwestern. The Biostatistics and Bioinformatics Core, directed by Denise Scholtens, PhD, professor of Preventive Medicine and Neurological Surgery, will manage data collection and storage, provide bioinformatics analysis, and contribute to interpretation of results from preclinical studies and clinical trials. In addition, a Career Enhancement Program will nurture early stage investigators in neuro-oncology research, and a Developmental Research Program will provide funding for the early development of additional novel approaches for treating glioblastoma that have a strong likelihood of developing into fully-fledged SPORE projects or being spun off into independent translational research initiatives. Northwestern’s large brain tumor enterprise is fertile ground for these future projects, according to C. David James, PhD, the Jean Malnati Miller Professor of Brain Tumor Research and co-PI of the SPORE.